Arozzi Torretta/XL Series ▷ Size & Buying Guide on GOTURBACK.UK! The Arozzi Torretta/XL is a hefty investment compared to standard office/desk chairs, but the comfort and design quality warrants the asking price. As far as gaming chairs go, this one offers all you really need for a fair price. The Arozzi Torretta/XL has a sturdy metal frame, arm rests and is adjustable to suit your requirements. Compared to standard desk chairs, this gaming chair offers a sporty look that will look great in any man cave or games room, and offers the comfort and support you would expect from a chair that you may spend hours – or days! – sitting in. XL Edition, Wider, Bigger, Better! The Arozzi Torretta/XL is 10cm wider than standard gaming chairs, allowing it to hold more weight and giving more room for comfort. The wider chair shell design is based on a racing car seat, so it not only looks cool, but it is also incredibly comfortable. The cold-moulded foam is cushioning contours to the shape of the user, with the hard wearing fabric and leather covering being easy to clean and great looking. The Arozzi Torretta/XL gaming chair features a 5-star metal base and frame on five twin casters for ease of movement. The leather and fabric covering on the chair gives it an executive appearance. Polyurethane armrests offer support and comfort. The chair is rockable up to 12 degrees and can be locked in place. The height-adjustable gas lift, adjustable lumbar and neck pillows, and adjustable arm rests allows you to experiment with the chair until you find a position that best suits you. 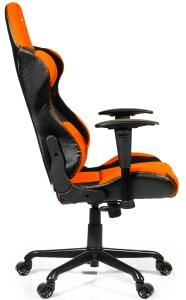 The thick cushioning and neck and lumbar support make this a great chair for protecting your posture and preventing the back and neck ache that gamers so often suffer from. The arm rests are really comfortable for resting your elbows on during gameplay, even after a few hours in the same position, my elbows were fine. Compared to a standard desk chair, the contours and adjustability of the Arozzi Torretta/XL chair make it much more comfortable for gaming. The additional support offered from the cushioning allowed me to play for hours without any aches or pains that I would normally have got from a regular desk chair. Unlike many of the gaming chairs on the market, the Arozzi Torretta/XL gaming chair is available in whopping seven colours, allowing you to choose one that really fits in with your games room decor. The chair is available in black, pale blue, dark blue, orange, green, red or grey, giving you way more choice than most other manufacturers. The adjustable lumbar and head support cushions are included with the chair, but you can also buy them separately if you want to choose different colours. The Arozzi Torretta/XL chair is designed with the slightly larger or taller gamer in mind. The 10cm extra width on the seat is accompanied by an increase in the weight the chair can accommodate. The chair can hold up to 140kg and 190cm in height. Bear in mind these are the maximum recommended loads, and the chair actually works best with a maximum weight of 120kg and 185cm.